My mom is responsible for creating wonderful Thanksgiving traditions that go beyond the traditional. There is always plenty to eat for vegetarians–not just a heap of potatoes and a roll. She is a vegetarian and an incredible cook, and makes a meal that herbvivores and carnivores enjoy side by side (salami, stuffed mushrooms, meatballs, spinach pie, sweet potato casserole to name a few favorites). This year was no different–the family getting together and enjoying delicious food made it my favorite day of the year. Thanks, mom! Perhaps our family’s most unusual Thanksgiving ritual is the annual voting of the food. At the end of the meal, each dish is voted and commented on anonymously. My dad then reads all the comments while someone else tallies up the votes. Since many people in my family pride themselves in their terrific senses of humor (who is the funniest? ), the comments are hilarious. The least favorite dish is not invited back on the menu the following year. Several years back, I remember the turkey getting the lowest vote, but an exception was made for the bird. I did not understand why an exception was made, since I enjoyed vegetarian Thanksgiving year after year and did not miss the turkey one bit. Now that I am back to eating meat after an almost 20-year hiatus, I was curious about this turkey business, and eager to contribute a second turkey for the holiday meal. I picked it up from Stinky Brooklynon Smith Street. The turkey came from Stonewood Farms in Vermont. It was antibiotic and hormone-free, and pasture-raised with uncrowded open sided barns. Turkeys from true family farms such as this one are a far cry from what is produced and being called ‘turkey’ on the mass-market. Although I still don’t think turkey is a necessity on Thanksgiving Day, I enjoyed preparing the turkey with my husband this year. I looked up a recipe (Alton Brown’s Good Eats Roast Turkey), he did most of the hard work, and I watched in awe. Now, of course, there are tons of leftovers. 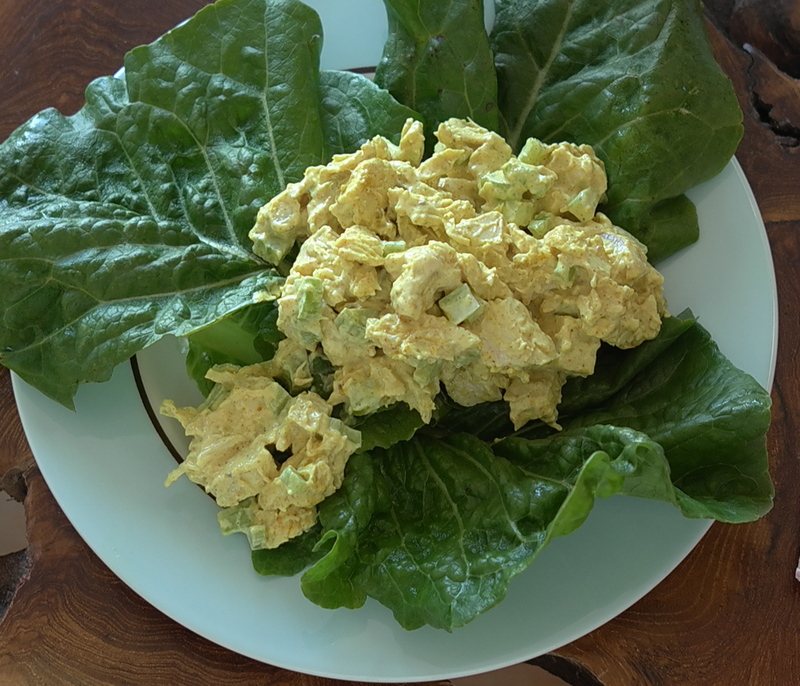 This morning I made a turkey soup and this quick recipe for curried turkey salad. Enjoy! 1. Mix together mayonaisse with curry powder. 2. Fold in turkey and celery and combine. Add salt and pepper. 3. Serve over a bed of greens, or in a sandwich. Here is a spin on an American classic. I started with Alton Brown’s recipe, and adapted it. Depending on your preference, you can use either regular bacon or soy bacon instead. The turkey bacon comes from Applegate Farms. I highly recommend taking a few minutes to look around their website. We got the eggs at the Carroll Street farmer’s market, and they came from Bar None Ranch in Berlin, NY. I am writing the steps in the order that makes sense to share some pans and hopefully cut down on the cleaning time. You need to use at least three burners for this recipe, so be prepared. I know the several steps and multiple burners seems daunting, but the steps are mostly quick and easy. The whole thing should take 30 minutes or so. Do you have a spin on a classic American Salad? Maybe you do a cooler Cobb or a whimsical Wedge…Or maybe you have a classic that you are looking to spin but are not sure how. Send your ideas and I’d love to try them out! 1. Place the spinach in a large mixing bowl. Hard boil the eggs. I did it this way: Place the eggs in a saucepan and cover completely with water by one inch. Bring the water to a boil. Then, turn off heat and cover. Set timer for 15 minutes. When a few minutes are left, prepare a bowl of ice water. Remove from heat and immediately place eggs in ice water. Chill for a few minutes. Carefully peel. Then, slice and set aside. While the eggs are cooking, start to fry the turkey bacon. Fry until crispy, turning when you feel like it (Clearly, I am still a novice with meat…just cook it until it’s done.) Then, crumble it, tear it, or cut it into small pieces. Add one tablespoon of olive oil to a small saute pan, and heat it up over medium heat. Add the garlic and cook until fragrant, about 30 seconds. Add the mushrooms and stir. Add the white wine. Stir occasionally until mushrooms cook down and are slightly browned. Once the eggs are ready, start making the dressing: In a small saucepan, heat 3 Tablespoons olive oil over low heat. Whisk in the vinegar, mustard, and sugar. Season with salt and pepper. 7. Putting it all together! Add the mushrooms and onions to the spinach, and toss. Add the bacon and dressing, and toss to combine. 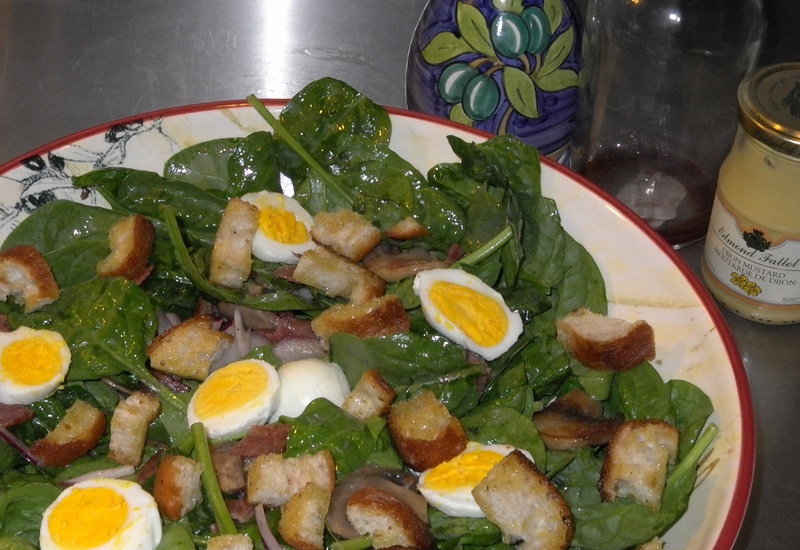 Top the salad with sliced egg and croutons.